A dead battery is a driver’s worst nightmare. You go to start your car for work one morning and find out that your car battery is dead. How do you know if you need a boost or a new battery? Are there any ways of knowing when your battery is going to die? 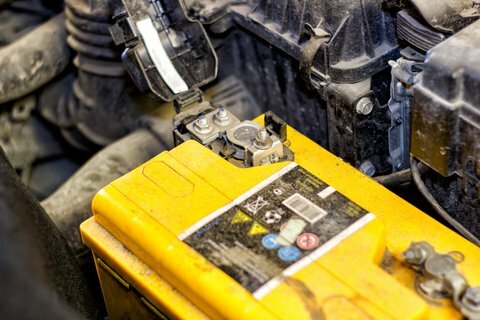 Here are fives things you need to know about your car battery and when to replace it. The average lifespan of a car battery is three to six years, depending on a number of different factors. Your car’s age, your driving habits, and the demands of your car’s electrical system all have an impact on how long your battery will last. Your car’s battery recharges as the car drives. If your car has been sitting inactive for a while, you may need a boost to get it started again. Don’t worry though! Once your car runs for a bit the battery should charge up again. Extreme weather is hard on batteries. When the weather gets cold you may notice that it takes more effort to get your car started. You may even need a boost! Believe it or not, extreme heat is actually worse for your battery as it can cause the battery fluids to evaporate. It’s not until the colder winter weather that you notice the effects. Sometimes there are warning signs of a failing battery, sometimes it just happens. Obvious signs to watch out for include a bulging battery or a rotten egg smell. More subtle signs include flickering headlights or other unusual electrical problems. Before you replace the battery, make sure you check the alternator. A lot of people think that when a car won’t start it must be the battery. Sometimes the problem is with the alternator, which is responsible for recharging the battery. If you have a newer battery that doesn’t seem to be working, be sure to get the alternator checked before buying a new battery. While there isn’t much you can to extend the battery life, regular maintenance can help address problems early. Battery performance and reserve testing can show if a battery is starting to decline. The professional team at Park Muffler can test your battery and diagnose problems early, letting you know if the problem is really with the battery or if it’s something else. Contact us today to arrange battery/load testing.